Christopher “NYChrisG” Gonzalez has been known as a championship-caliber fighting game player for years thanks to his dominance of the Marvel vs. Capcom 3 scene, but a recent comeback victory proves he’s ready to make his mark on Street Fighter V.
The newly-established Cen-Cal Standoff is just what it sounds like: a major tournament series for Central California, catering to players and fans living between the big scenes in Northern California (i.e. the Bay Area) and Southern California (i.e. Los Angeles). After a day of high-level play in games like Ultimate Marvel vs. Capcom 3, Super Smash Bros. for Wii U, and Super Smash Bros. Melee, Cen-Cal Standoff’s debut was looking at a strong finish with Street Fighter V as competition wound down to the grand finals. Gonzalez, an east coast transplant now living in Southern California, was looking to build off his win at Naptown Clutch VI near the end of February. His challenger was Brian “bjUNCHAINED” Jeon, a young player from Northern California in search of his first major win. Gonzalez had the advantage thanks to having made his way through Cen-Cal Standoff without a single loss. Jeon, on the other hand, needed to win two full sets after falling to Gonzalez in the early stages of the finals bracket. In their previous meeting, Gonzalez looked very much in control, closing out the match with a score of 3-1 on the back of significant predictions into Jeon’s offensive playstyle. Grand finals were more of the same. Jeon’s chosen character, Street Fighter V newcomer Necalli, relies heavily on momentum, pressuring opponents until he can transition to his more powerful form by activating V-Trigger. That type of momentum, however, is often in short supply when facing Guile, who Gonzalez has been putting to good use since switching to the character last summer. Despite earning his spot in grand finals thanks to strong showings against players from across California, Jeon was again unable to find any footing in his rematch with Gonzalez, and he quickly found himself on the verge of another loss. As their match came to an end, Jeon saw some light at the end of the tunnel. One round away from another loss, he landed a damaging combo off stun that looked like it may kill, but Gonzalez survived with an infinitesimal amount of health. So small, in fact, that it wasn’t even visible on the health bar at the top of the screen. Jeon, on the other hand, had taken little damage in the exchange, and seemed poised to extend his tournament life just a tiny bit longer. Instead of accepting his fate, Gonzalez went on the offensive. 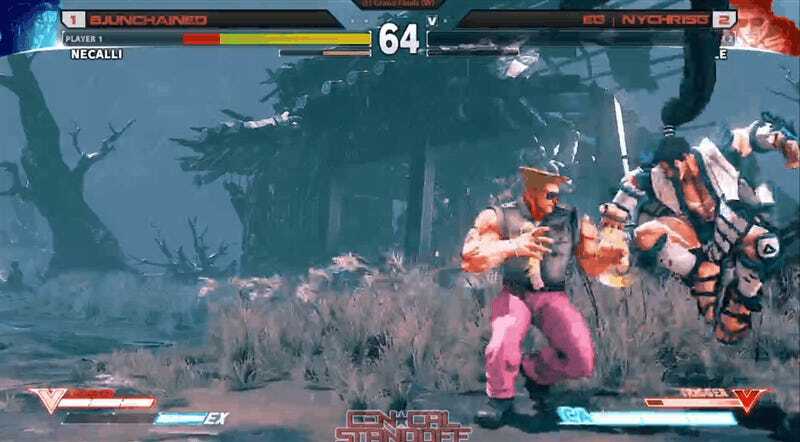 After activating Guile’s projectile-boosting V-Trigger, he trapped Jeon in the corner with throws and then locked him down with Guile’s plasma-chucking prowess, turning the tables by draining Jeon’s health almost as fast as his had disappeared. With stun imminent, Gonzalez went for the hail mary, again baiting Jeon into making an unfortunate attack and countering with the invulnerability on Guile’s Flash Kick, ending his Cen-Cal Standoff journey as champion thanks to the incredible “magic pixel” comeback. While a significant event in its own right, Gonzalez’ victory at Cen-Cal Standoff is another indication of how even historically defensive characters like Guile have been updated to survive in the offense-heavy Street Fighter V. Where in previous games Guile players were content to sit back and toss Sonic Booms, daring opponents to find the hole in his armor, Capcom has provided the American hero with a number of tricks, like his V-Trigger, that make him just as capable on the attack. Nowhere has this been more apparent than in Gonzalez’ capable hands. Winning a tournament under any circumstances is an accomplishment, but snatching victory from the jaws of defeat? That’s what champions are made of. Gonzalez has a bright future with Street Fighter V.